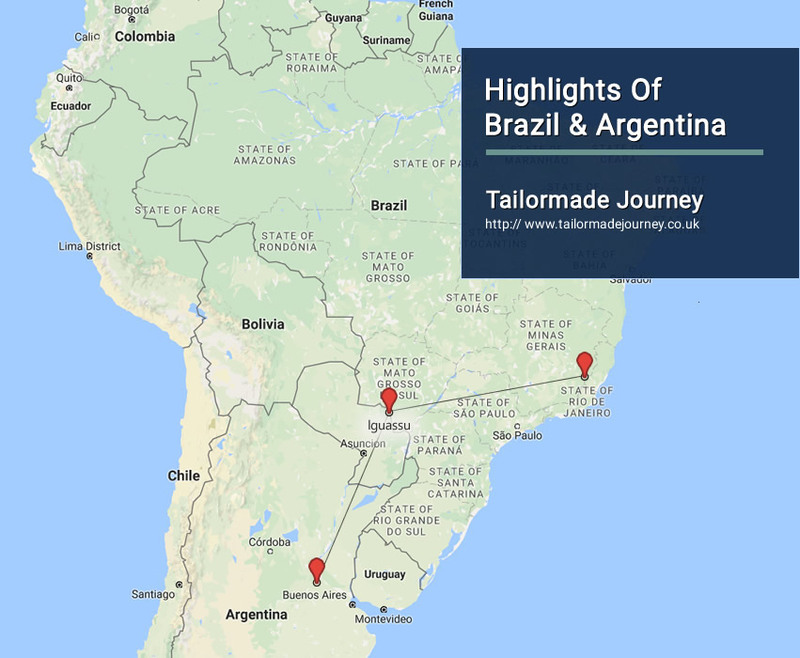 This tour takes you to the Main Sights of Brazil and Argentina. Visit the Marvelous City of Rio de Janeiro, visit Iguaçu National Park and in the end visit to the capital of Argentina Buenos Aires. Arrive Rio de Janeiro 3 Nights > Flight Iguassu Falls 2 Nights > Flight Buenos Aires 3 Nights & Leave. FD Sugar Loaf wit City tour + Corcovado with beaches + lunch – Over a million tourists a year visit the world famous Pão de Açúcar, or Sugar Loaf Mountain in English, which has become an iconic symbol of the city of Rio de Janeiro. Rising up from small peninsula at the entrance of Guanabara Bay, its name is said to refer to its resemblance to the traditional shape of concentrated refined sugar loaf. The tour is done in two steps by glass cable-cars. The first cable-car takes passengers to the top of Urca Hill, which rises 215 meters above sea level and offers spectacular views of the entire bay its islands. From Urca Hill, passengers continue in a second cable car to the top of Sugar Loaf which rises 395 meters above sea level and offers a 360 degree view of the entire city including Botafogo and Copacabana Beaches, the Corcovado and downtown Rio.We will to visit the Christ Statue, which was recently elected as one of the seven modern wonders of the world, which sits 2,300 above sea level, atop Corcovado Hill. Following a scenic drive along the Rodrigo de Freitas Lagoon, we will arrive at the foot of the hill from where we ill embark on a small train which climbs the beautiful mountain. Upon reaching the top, visitors will experience a panoramic view of Rio de Janeiro and discover why it is known as the “Marvelous City”! Tour also includes a drive along Rio’s famous beaches. Lunch is included. Macuco Safari: The trip begins within the National Park on the Brazilian side, where visitors take seats in an open wagon driven through the forest where they can observe birds, animals and exotic vegetation all while accompanied by a specialized guide. At the end of the 2 km ride we continue on foot to the margin of the Iguassu River to take a specially prepared motor boat for an exciting and unforgettable trip. Passengers are taken as close as possible to the water falls, where they can hear the thunderous roar of the walls of water, and get wet from the mist of the falls. Overnight Stay at the Hotel in Buenos Aires. Transferred to Buenos Aires Airport to board flight for onward Journey . Recoleta Grand offers plush accommodation in the upscale Recoleta district. Patio Bullrich shopping centre is 700 m away. Decorated with stylish furnishings, rooms at Recoleta Grand are fitted with air conditioning, smart LED TVs and remote devices to switch the lights on or off and draw the curtains. All of them have iPod docking stations and provide city views. A butler service is provided. Breakfast is served daily at Recoleta Grand. International dishes can be ordered at the property’s restaurant. Guests can benefit from several beauty treatments at the spa. They can take a dive in the pool or get fit in the gym. A babysitting service is provided. Recoleta Cemetery is 400 m away. Recoleta Grand is a 30-minute drive from Ministro Pistarini International Airport, in Ezeiza. NH Buenos Aires 9 de Julio offers state-of-the art accommodations with free WiFi access and impeccable services. The hotel faces the 9 de Julio Avenue and provides dazzling views of the city and it’s landmark, the Obelisk. With elegant décor, rooms are styled in cream-coloured hues and include minibars, cable TVs and safety deposit boxes. All guestrooms are fitted with various bathroom amenities, telephones, air conditioning and heating. NH Buenos Aires 9 de Julio includes a seasonal outdoor swimming-pool, a sauna, fitness facilities and a bar. The on site restaurant features delicious meals following Spanish recipes. The chef´s creativity is also displayed in the daily buffet breakfast. Lunch, dinner and room services are also available. At this hotel, guests may also enjoy 4 business salons, properly fitted with a capacity of 120 people. NH Buenos Aires 9 de Julio is surrounded by tourist and commercial attractions. Colon Theatre is 600 m away, whereas Florida Pedestrian Street is 700 m from the property. The hotel is 400 m from Mayo Avenue. Continental Inn Hotel offers accommodation in Foz do Iguaçu, 13 km from Birds Park. The hotel has an outdoor pool and sauna.Each air-conditioned room features a minibar, cable TV and a private bathroom fitted with a shower. A restaurant and two bars are found on site, providing meals and drinks for all tastes. Continental Inn also offers an executive office and different shops, as well as room service until 23:00. Safes are available for a surcharge. You can play tennis at the hotel. Iguaçu Waterfalls is 21 km from Continental Inn Hotel, while Iguaçu National Park is 21 km from the property. The nearest airport is Foz do Iguacu/Cataratas International Airport, 11 km from Continental Inn Hotel. Belmond Hotel das Cataratas allows guests to enjoy a cocktail by the swimming pool or play a game of tennis on the provided court, and also provides free WiFi. Belmond Hotel das Cataratas offers traditional Portuguese styled rooms with a flat screen TV, dark wood furniture and warm natural tones. Some rooms provide a balcony and seating area. The Ipe Grill Restaurant provides view of the pool and the Itaipu Restaurant provide view of the falls. They serve a selection of international and local Brazilian cuisine. In the evening live music can be enjoyed in the downstairs bar. The Iguaçu Falls lie between the Brazilian state of Paraná and Argentina. The Brazilian side offers postcard panoramic views, while the Argentinian side provides varied, up-close views. This property also has one of the best-rated locations in Foz do Iguaçu! Guests are happier about it compared to other properties in the area.